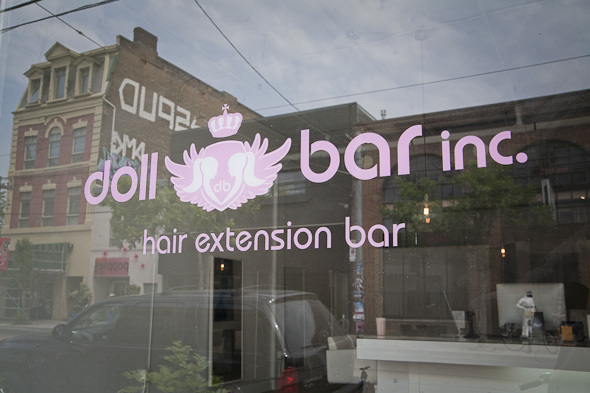 Doll Bar Inc. is a new salon dedicated exclusively to hair extensions. 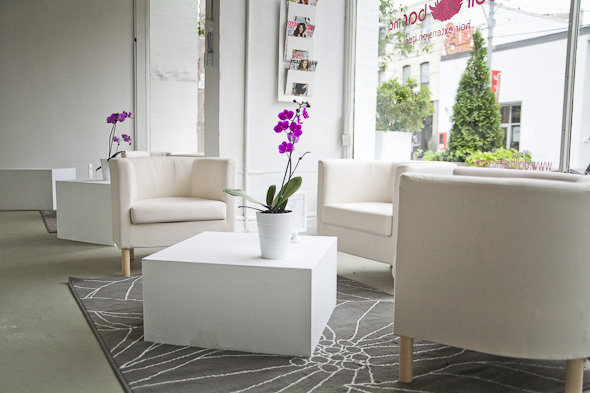 In the same way blow dry bars such as Blo and Do My Hair have found success in focusing in on one specific salon service, Doll Bar Inc. knows one thing, and knows it well. "I want this to be the place to get extensions," owner Melissa McKenzie tells me as we tour the pristine white space on Queen West near Dovercourt. Doll Bar looks very much like a typical salon, though its chairs face inward toward a central square bar where a receptionist caters to your caffeine and other needs. "I always hated how in most salons you're stuck facing the wall," Melissa says. "You're so disconnected. Here, when you're all done, we'll spin you around for the big reveal." Melissa had been working as a hairdresser for eight years before she came up with the idea to open an extension-exclusive salon. 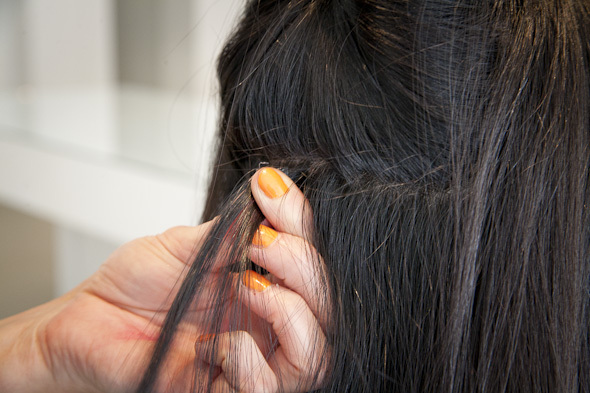 "The moment someone gets extensions, her whole body changes," she says. "It's really fun to give someone that bodacious hair." The key to Doll Bar is buying direct, which allows Melissa to charge between $398 to $649 for a full head of So Cap hair extensions from Italy. Most other salons, according to Melissa, can charge upwards of $1,500. "I've looked on Craigslist and Kijiji," she says, "and stylists there advertise to do extensions more cheaply, but it's usually out of their homes. You don't get that salon experience. Plus, you never really know what you're going to get." 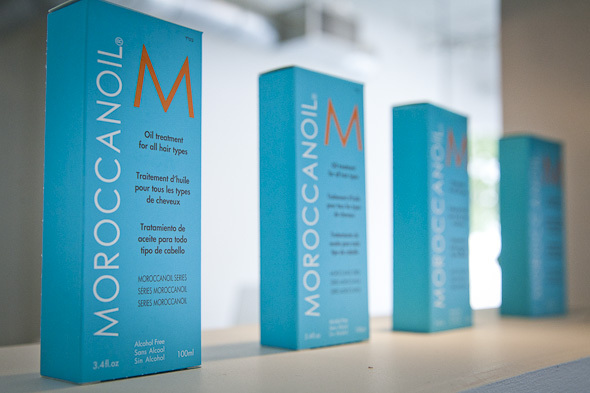 Though Melissa and her team know extensions through and through, she admits that some damage to the hair is inevitable. "But how they're applied and cared for can make a difference," she says. "We try to lessen the damage as much as possible." I, personally, have never really been the extension type, mostly just because I usually have too much hair than I know what to do with. But not all of the extensions offered at Doll Bar are just for increasing body and length. "These are actually rooster feathers," Melissa says, eagerly pulling a few thin, dyed feathers out of a plastic package. "They're really big in L.A."
We somehow find ourselves before Melissa's pink laptop looking at pictures of a Ke$ha with feather extensions, when Melissa suggests I try one out. "Sure," I say, and prepare myself for some sort of laborious application. But a little glue and a pinched metal clasp, and the sleek black feather ($15) is instantly applied. "Most people get them in threes," says Melissa, who has a few in her hair already. "They're a really fun way to change things up." For now, Melissa is happy with her West Queen West salon, but she has dreams of expanding to Montreal, New York, and Las Vegas. "Every girl in Vegas seems to have extensions," she says. And for those in Toronto who don't, Doll Bar Inc. offers full head extensions ($398 and up), micro loc weaves ($325), permanent eyelash extensions ($185) and more.